Here at the 365PDXq blog, we’ll occasionally look at one Portland gayborhood in particular. This time, let’s traipse through North Portland. Ready to take on the Fifth Quadrant? North Portland is best known for St. Johns, a little town square in the farthest reaches of NoPo. St. Johns has a lively history, as it was one of the first main burgs along the Willamette, each one competing to be the main hub of the growing region. The city of Portland won out and annexed St. Johns in 1915, but the separatist mood still survives in this far-flung outpost of PDX. You can get to St. Johns by going as far west on Lombard Avenue as possible, or by crossing the beautiful St. Johns Bridge from NW Portland. Even though it is remote, St. Johns has its own movie theatres, a McMenamins outpost, a food cart pod, and farmer’s market. Once you get there, you may never need to leave. North Portland has long been popular with the LGBT population of Portland. Its alternative flavor has welcomed and provided safe harbor for those not interested in the downtown scene. While there are no strictly queer nightspots or watering holes, both the Mock Crest Tavern and the Foggy Notion are uber-queer-friendly. And, The Fixin’ To hosts the queer mixer Sweet Tea on a semi-regular basis. Plus, the Q Center and The Eagle are not too far away. 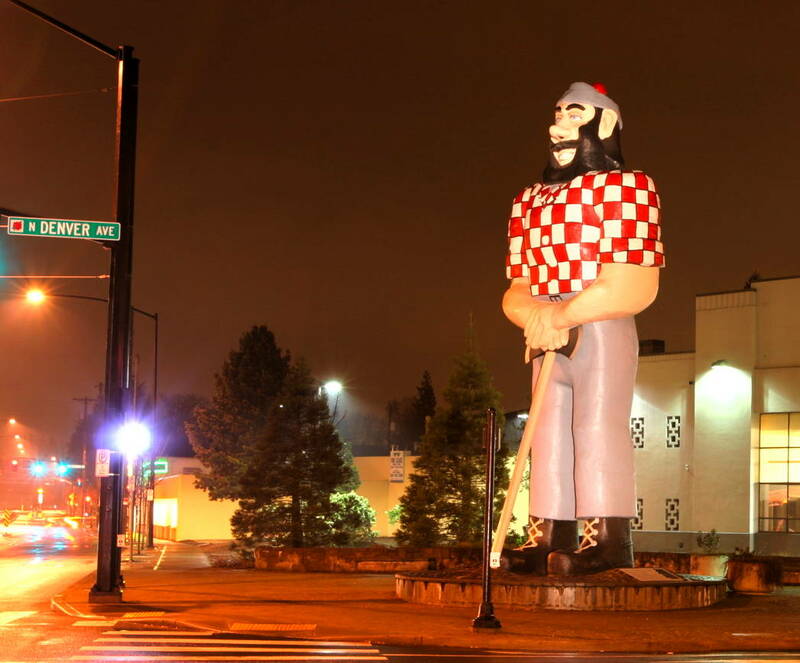 Read the whole article, with information on Paul Bunyan up there, plus parks and architecture, over at the Portland Gayborhood website. This entry was posted in gay Portland neighborhood, gayborhood. Bookmark the permalink.